In Bali, the awesome raw power of the possible eruption of a volcano is a close-at-hand experience. Small rumblings and tremors, coming from deep within, reach far into the island as the shaking of the surrounding earth layers creates a pathway for releasing the gases and lava the volcano has held for the last 63 years in its deep caverns. Animals leave the mountain. Dogs bark throughout the night. 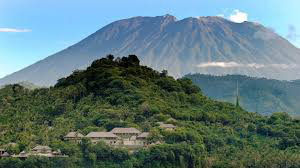 To the residents of the volcano’s hills and valleys hurriedly making their exodus while the volcano is trying to birth its inner being, the mountain is their nemesis. Leaving home and livelihood behind and settling in camps, they panic, feeling their existence and livelihood are threatened. This generates a vast collective energy field of fear that interacts with its surroundings and, thus, with the volcano’s behavior as well. It is an energy field that stimulates compassion and much active engagement of individuals and organisations to support those who left their homes and livelihood behind with food, love and care. This in turn creates a collective energy field of love and compassion in which the collective fear can be held and embraced. This loving vibrational field flows towards the volcano. Just as each of us influences others through thoughts and emotions, so energy fields influence the individual. The vibrational field of love surrounding the mountain will allow it to go through its process more smoothly. Balinese priests hold intense ceremonies high up, close to the crater and at the mother temple, an extensive conglomeration of buildings on a hill below the mountain. 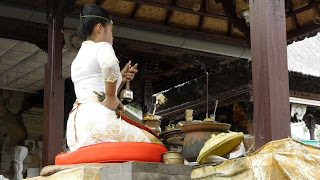 The mother temple is the holiest of Bali’s temples. The highest priests, the Brahmans, bless and soothe the mountain’s activities through various powerful rituals and animal sacrifices. They chant mantras and recite old texts in the original Sanskrit. They call strong rains to come, and, indeed, they come. The ash released into the atmosphere and the lava flowing down the volcano’s green ravines, flanks and valleys bring life-giving elements from deep within the earth back to the abused soils and surface of our planet. The clouds of ash and fiery lava, once cooled and decomposed, will, in time, foster rich, nourishing soil, and flora and fauna will eventually re-emerge and thrive, healthy and strong. They are blessings in disguise. The whole island is a volcanic creation; its earth and soil are not independent of the rumblings of the holy mountain and the center of the Balinese world. The soil at Jiwa Damai originates from the many eruptions of the island’s volcanoes and the subsequent erosions of the fallout. Eruptions are important from a permaculture garden perspective. As conscious caretakers and co-creators developing permaculture and re-establishing a natural balance with the earth, we have a responsibility to engage in aligning with the cyclical process of renewal and the blessing the earth that allows values to come alive—earth care, people care ,sharing surplus, supporting the natural process of the growth of flora and fauna, allowing the soil to recuperate from abuse. Nature and the mountain are the teachers to follow for designing the garden. A relationship between humans and the mountain has existed for eons. Guardians of volcanos who had special abilities and were chosen at a young age by the reigning sultan existed in the Indonesian archipelago in olden days. It was a great honor to be called. The guardian learned to live on and with the huge majestic volcano, to sense each of its slightest moves, outbreath and inbreath. He was in awe of the mountain but at the same time it became his closest friend. He knew each breath of the mountain intimately It was the guardian’s duty to inform the people when the volcano was going to move and erupt—to guide them to leave the mountain. Eventually, with age, the guardian was revered by the local people as a wise man. Sometimes a guardian stayed on the mountain to embrace death in the fiery lava flow when his time came. He could be found later in a kneeling and praying position, having chosen to leave his body on the much loved and revered mountain. She-Soul, witnessing the funeral of the beloved guardian, experienced all of a sudden a huge expansion in her energy bodies, extending into an unknown deep distance with infinite peripheries. She was surprised, what was her relationship with this old man on the mountain? As she saw the small body covered with a cloth, lifted on many shoulders carried past many more to his resting place in the earth, she merged with his incredibly deep dark and warm earthy vibrational field, which seemed to extend infinitely in its multidimensional expansion. Being one with this field, She-Soul became one with the old man on the mountain as well. She became his feelings and perceptions. His incredible deep love for the mountain, whose majestic being he so honored, befriended and was in great awe of. She-Soul allowed herself to sink deeply into this sea of intense respect, greatly expanding the heart space, embracing the dark breath and warmth of the earth, all living beings—flora and fauna—at the same time. Ahhh! What a miraculous multi-dimensional experience extending and transcending space and time. A deep trust and homecoming, appreciation and awe of being held in this love energy field. Deep insights ensue. Tthe mountain is a conscious being, an expression of the movements of Gaia. It has a deep interconnectedness and continuous communications through channels in the innermost with all other volcanoes on the rims of the tectonic plates at the mantle of the earth. The volcano does not intend nor like to be the cause for human suffering. It is an archetypal and physical expression of Gaia, created in the distant, ancient beginning when time had not been invented yet. The mountain was ensouled at the beginning of Gaia’s evolutionary path, circling the outer rim of our milky way star system. As a child of Gaia, the mountain is ever transforming and evolving in consciousness. Having witnessed eons pass and many civilisations come and go, it demands awe and reverence, to have its presence honored and to be aligned with Gaia’s moves. The mountain is surprised to have people living in the path of its possible expressions of gas and lava flows. Now is the time to witness this process of transformation being brought to the surface and seen by the world and to have the knowledge deep within us that the mountain needs our love and acceptance for the work it is doing to support the earth in its transition to the next density. A deep bow o the mountain and its activities. Dr. Margret Rueffler is a transpersonal psychologist, acupuncturist and permaculture trainer, and the founder of Lagu Damai Foundation and Jiwa Damai permaculture gardens in Bali.